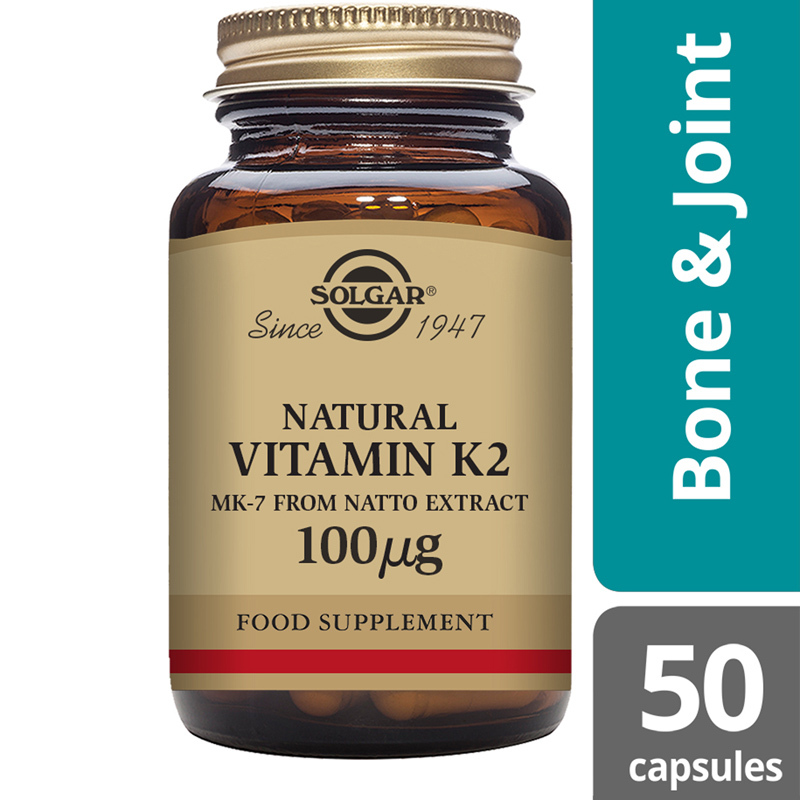 Solgar® Natural Vitamin K2 (MK-7) 100 µg Vegetable Capsules utilises the highly bioavailable natural form of Vitamin K, Menaquinone-7. 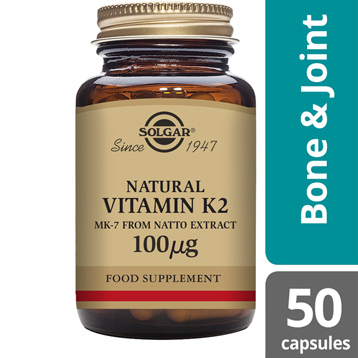 Vitamin K is known to play an important role in bone building and blood clotting. 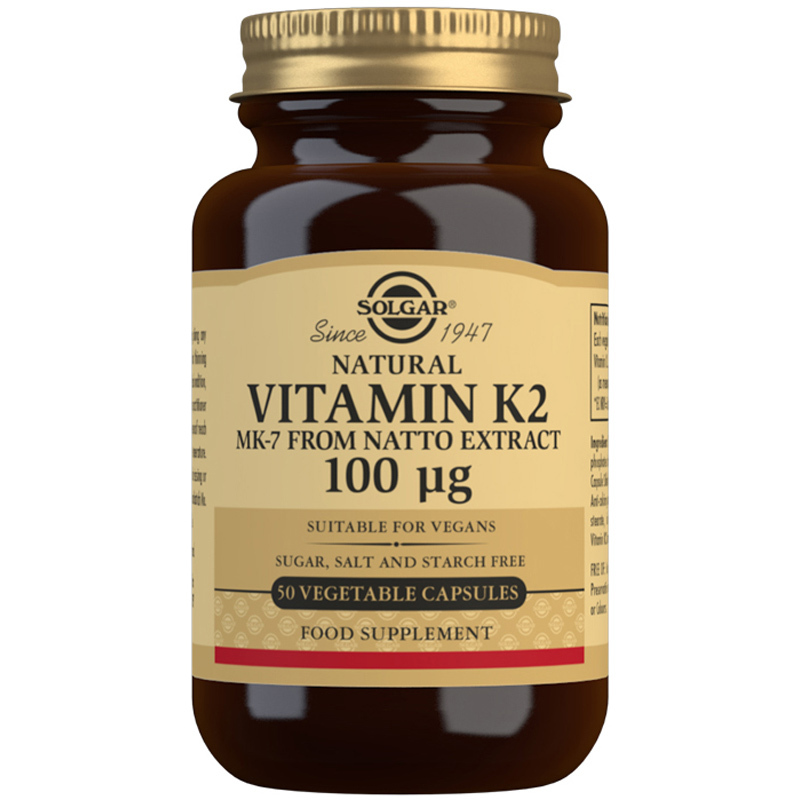 This unique vitamin K is derived from natto, a traditional Japanese fermented food, known to be rich in vitamin K and with a long history as a superfood. WARNING: Vitamin K Food Supplements should NOT be used by an individual who is using blood thinning medication, please ALWAYS consult a healthcare professional before considering using a food supplement product when already using any form of medicine. Ingredients: Bulking Agents: (dicalcium phosphate, dextrin, maltodextrin), Vegetable Capsule Shell: hydroxypropylmethyl cellulose, Anti-caking Agents: (vegetable magnesium stearate, silicon dioxide), Cellulose Gum, Vitamin K2 (as menaquinone-7). Bulking Agents: (dicalcium phosphate, dextrin, maltodextrin), Vegetable Capsule Shell: hydroxypropylmethyl cellulose, Anti-caking Agents: (vegetable magnesium stearate, silicon dioxide), Cellulose Gum, Vitamin K2 (as menaquinone-7).